This is a list of pre-release and unused content for the game Super Mario Bros. 3. For pre-release and unused content pertaining to the remake, Super Mario Advance 4: Super Mario Bros. 3, see List of Super Mario Advance 4: Super Mario Bros. 3 pre-release and unused content. At the beginning of production, the development team of Super Mario Bros. 3 wanted the game to use an overhead, isometric view. The developers found that it was difficult to balance the platforming gameplay around this perspective, leading them to abandon the idea. Several graphical elements of the final Super Mario Bros. 3 were influenced by the original direction, such as the black and white checkered floor on the title screen. 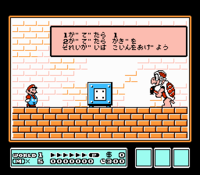 Designers considered a power-up to turn Mario into a Centaur (half-man, half-horse), although this was rejected before being implemented into the game. As seen in early screenshots, Koopa Troopas and Hammer Brothers were going to host two mini-games. 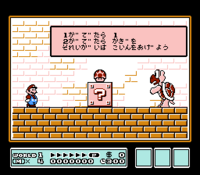 The minigames were a Question Block and a dice game respectively, which also would have marked the first Mario game to have the Koopas standing on two feet instead of all fours. These minigames and their hosts seem to have been replaced by Toad. An early build of the game was previewed in a promotional VHS tape coming with the September 1988 edition of the magazine Famimaga. The preview shows several levels unused in the final game, a different sprite for the Wooden Block and a slightly different status bar. The back of the box of some early copies of Super Mario Bros. 3 depicts Mario traversing a hilly grassland stage with many Para-Beetles and two Note Blocks. This particular stage is not any of the lost ones present on the cartridge, nor is it in the final game. These boxes also feature a early map of Grass Land. Fifteen unused levels exist within Super Mario Bros. 3. Some of these are unique, while others bear much resemblance to levels seen in the final version. They can be accessed via Game Genie codes/cheats. Mario sprites intended for minigames. A frame of Hammer Mario sliding (this can be seen in-game with a glitch). An alternate front-facing frame of Frog Mario. An alternate sprite of Toad. A gold version of a Cheep Cheep. A green version of a Para-Beetle. An unused "P-Ball" sprite. Purpose unknown. A sprite of an open Treasure Chest. Map animation of Mario walking to the side. Map animation of Mario walking up. A question mark meant for the world map. A skull meant for the world map. A breakable pipe connector found in the desert tileset. A background pillar found in the deset tileset. A sandstone block found in the desert tileset. A ladder and brick design found in the desert tileset. An unused propeller found in the underwater tileset. An unused frame of some sort found in the castle tileset. Possibly meant for the top of the door in the Bowser fight. Unused sprites of spikes and a wheel found in the Dark Land tileset. An unused block found in the versus mode tileset. Unused water and ground level. The Spade card minigame originally featured an invisible wild card which would match one of the cards already drawn by the player. If matched with itself, the wild card acts as a 20-coins card. On boards with an uneven number of wild card, the mechanic would make the minigame unwinnable as the wild card leave one card unmatchable. The code for the wild card was retained in Super Mario All-Stars. ↑ Designing a game in the Super Mario Bros. series is certainly different than creating one based on all new characters, but it is just as challenging. The difficult task is to make familiar characters seem fresh. In each of the previous SMB games, Mario gained new power-ups. So in SMB 3, Mr. Miyamoto and the other designers wanted to invent another new, interesting way for Mario to power-up. Their initial ideas tended toward having Mario turn into some sort of creature. A concept that was rejected was having Mario power-up as a Centaur (half man, half horse). The idea that they finally settled on was to give Mario a tail and the ability of flight. Their first tail concept, that of a Racoon tail, was the one that finally stuck. This page was last edited on November 21, 2018, at 16:22.